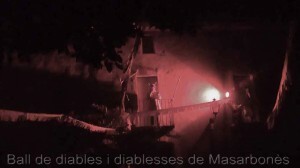 The Devils of the deep Masarbonès have the dual function of Versots evil and cry of festival, why we stayed with the opening speech without giving it more times in the terminology. With the years we have lost some of the initial deep, but that so many petem that we have a handful. Later down the road we lost another speech, that of 2008, watery and beheaded by a torrential rain, when the preacher had said or three words and fled masarbonencs legs help me, for fear they might catch a calipàndria or be photographed in our Versots.